Just a day after it announced the LG Optimus L9, T-Mobile showed the smartphone off at MobileCon 2012. It's definitely a worthy member of the L-series of stylish (yet mid-range) handsets, sporting the same signature look and feel that the Korean manufacturer has taken to heart over the past few months. The device features a 4.5-inch qHD display, 2,150mAh battery, 1GHz dual-core TI OMAP 4430 processor with 1GB RAM, Android 4.0 (Ice Cream Sandwich), 5MP rear camera with 1080p video recording capability, Gorilla Glass 2, 4GB internal storage and external storage capacity and support for the usual T-Mobile HSPA+ radios. Power users may not have a lot of love or appreciation for this device, given its rather mediocre processor compared to the rest of the giants on the market today. But it feels comfortable in the hand, well-built and boasting the same leathery-textured battery cover as most of LG's recent phones. Check out our gallery below, and we'll continue to update our post with impressions after the break! 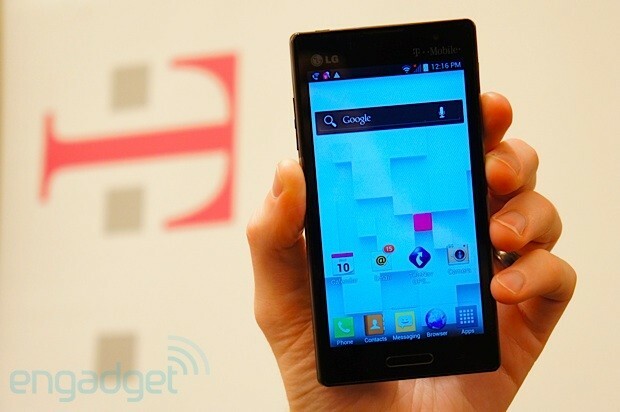 LG Optimus L9 for T-Mobile hands-on originally appeared on Engadget on Tue, 09 Oct 2012 22:57:00 EDT. Please see our terms for use of feeds.